Let me just preface this by saying that we’re not talking fancy, gourmet food today. (Not that I ever would call my food that.) But today is more about a quick, super easy lunch that The Phoenix and I have become quite fond of lately. With a new baby, I wanted to stock up our freezer, and while searching for recipes, stumbled upon this. It’s become one of our go-to lunches and I love that I can prepare these one day, stick them in the freezer, and have a good lunch for both of us in no time many days over. Mix taco seasoning with chicken. Divide seasoned chicken, beans, and cheese among tortillas. Roll up, burrito style. To Freeze : Wrap burrito in plastic wrap or wax paper. 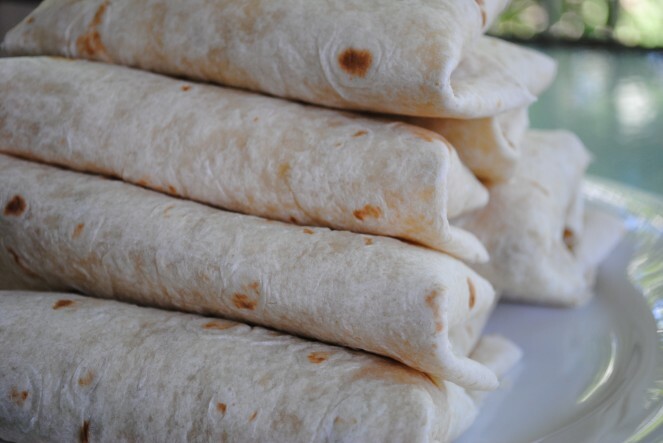 Place burritos in freezer bag, seal, label, and freeze. To serve: Remove plastic wrap and heat in oven at 375 degrees for 20 minutes or until heated through. (I flip it over halfway through cooking so both sides get crispy.) Serve with salsa and sour cream, if desired.